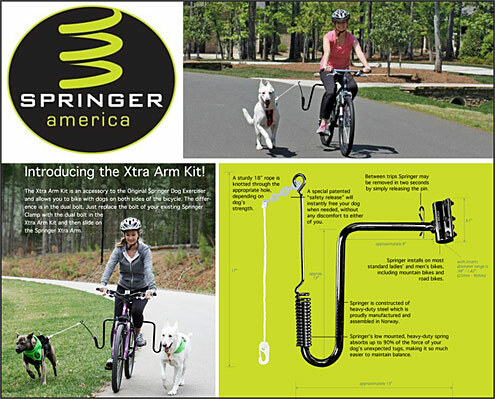 There is no safer, or enjoyable way to bicyle with your dog, than with the Springer Dog Exerciser by Springer America! The Springer Dog Exerciser is manufactured in Norway and imported to North and South America by Springer America. Springer America is owned by Kjell Ottesen, a native Norwegian who immigrated to the U.S. fourteen years ago. Like all Norwegians, Kjell is very proud of the products made in Norway and will personally attempt to make every buyer of the Springer happy with his or her purchase. The Springer is very well made and easily attaches to most bikes. If the customer is not happy with their purchase, just return the package within 30 days and Kjell will refund your money. Do I need to train my dog to work with the Springer? No, most dogs adapt to the Springer immediately. However, if your dog is not well conditioned, gradually increase your riding time over the first several weeks. The CEO at InfoHorse.com and DognOwner.com has a video of the FIRST TIME he put the Springer on his bike with his dog Cowboy-- this video shows the dog's FIRST TIME experience! What surfaces should I ride on? Ideally, you would ride on dirt roads, forest pathways, and other soft surfaces. Or, if you have paved bike paths with grassy shoulders available, you can ride on the hard surface, with your dog running beside you on the grassy area. If you do cycle on paved roads, just be cautious about the speed you ride, to protect your dog's paws. If my dog veers off in a different direction, will I need to adjust the Springer while I'm riding? No, with Springer, you can keep both hands on the handlebars at all times. The Springer keeps your dog gently, but securely, by your side, protecting him from pedals and wheels. If he does run around a tree or fire hydrant, the patented safety release will release your dog instantly, keeping you and your pet safe. Will the Springer work on my mountain bike? How do I know if I need the Z-shaped adaptor? Most tubular-shaped bike frames don't need the adaptor. But if you have a frame with a teardrop-shaped down tube, and your seat stem is too high from the ground for the Springer arm to perform optimally with your dog's height, you may need the adaptor. If you have any questions about this, just send an email to Kjell Ottesen, President, Springer America inc, at kjell@springeramerica.com and he will ask you the questions to gauge whether or not this will be helpful in your particular situation. What tools will I need to install the Springer? The Springer package comes with two main components: the clamp and the Springer arm. The first time you install the Springer, you will need a 13mm wrench to secure the clamp tightly to the bike. But after the initial installation, no tools are necessary. The Springer arm just slips on and is secured with a pin. When you want to remove the Springer arm, simply pull the release pin to detach the arm. What if i want to switch the Springer between two bikes? In that case, we recommend purchasing a second clamp, so that you can attach that to your second bike - and then you won't ever need any tools to move your Springer arm back and forth between bikes. What Do Dog Owners Say About The Springer? We use our Springer everyday that it isn't pouring outside. Our pit-bull, Emma, stays in such good shape and it affords her and my husband some "quality time". It's simply the best money we have ever spent for our pet's health. Today my dog lunged at another dog while on the Springer, but I was able to keep moving without being pulled over. The design is ingenious. One of the best dog care investments I have made ever! It has been a long time since I bought something from a company that cared so much for their customers. I wasn’t sure that kind of care and service existed any longer. But it does with Springer America. You will never regret buying the Springer. Your dog will be very grateful also. I love our Springer! It worked great from the first moment I put it on my Boxer/ American Bulldog Cowboy. In fact, I took a video of the FIRST time Cowboy ever tried the Springer Dog Exerciser. He and I have been hooked ever since. How Much Is The Springer? Don't leave your dog home alone anymore. Take him with you when you bike! You'll love the exercise it gives you both. Talk to our friendly staff today and let us show you how the Springer can bring you and your dog closer together!